Koinonia Farm is looking for someone to partner with us on our farm! We need one or more individuals with the vision and capability to manage an ecologically, socially, and financially responsible farm enterprise on the land with which we have been entrusted. We are open to a variety of long-term arrangements including cash rentals, crop shares, partnership, and employment. The land we currently manage is about 500 acres with 170 acres in agricultural use, including pastures, orchards, and gardens. In 2005, we stopped using synthetic chemicals on our land except for the pecans. Then in 2012, we began the transition to biological management of our pecans and the orchards have now been chemical-free for over 6 years. In addition, we are looking to add a new pecan orchard. We also grow blueberries, grapes, and vegetables. For years we also raised cattle, pigs, and chickens that we rotationally grazed through the pastures and orchards. We recently had to cut back on the size of our herd but would love to see another farmer expand the livestock. Our farm contains 4 wells, a barn, and 2 greenhouses. There is also a processing facility for pecans, a bakery, and cold, frozen, and dry storage. 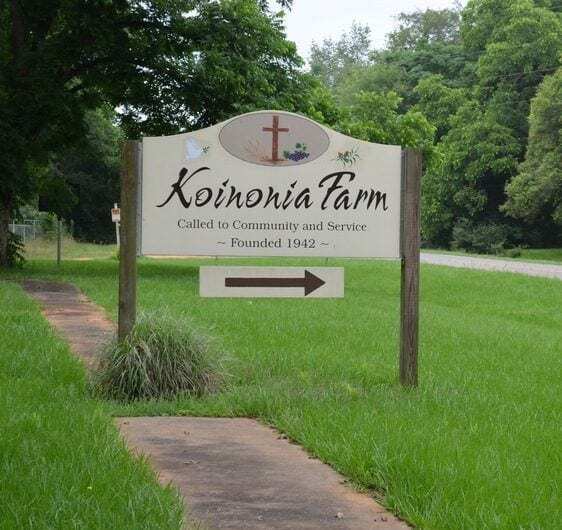 Koinonia Farm is a group of Christians called to live together in intentional community sharing a life of prayer, work, study, service and fellowship. We seek to embody peacemaking, sustainability, and radical sharing. While honoring people of all backgrounds and faiths, we strive to demonstrate the way of Jesus as an alternative to materialism, militarism and racism. There is a core group of people who live and work on the farm, supplemented by interns and guests who are here for a shorter time. Our work is to feed the hungry both physically and spiritually. In order to do this, we offer hospitality and spiritual renewal, education, prayer and spiritual direction. Some of our programs include youth camps, elder activities, partnerships with local service organizations, peace and justice work. In our bakery and mail order business, we occasionally offer seasonal employment. This mail order business also focuses on Fair Trade products, and organic land stewardship. You can read more about our history and our present on our website. This Request for Proposals is open to experienced farmers looking to start, expand, or take over management of a certified organic farming business. We accept applications on a rolling basis and will prioritize those who are ready to begin farming in 2019. If you are interested in learning more or have a vision for how you can work with Koinonia Farm, please fill out our interest form and someone will get back to you shortly. If you have any questions, you can contact Koinonia Farm at farming@koinoniafarm.org. Koinonia is seeking one or more individuals with the vision and capability to manage an ecologically, socially, and financially responsible farm enterprise on the land with which we have been entrusted. We have thought through and are open to a variety of arrangements including cash rentals, crop shares, partnership, and employment. We are looking for a long-term partner. If you are interested in learning more or have a vision for how you can work with Koinonia Farm, please fill out our interest form and someone will get back to you shortly. 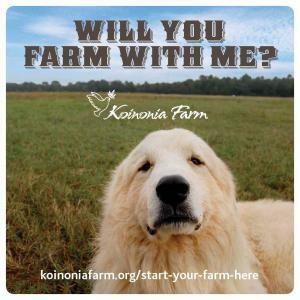 (Interest form coming soon- please email farming@koinoniafarm.org for more information). The crèche is put away now, but not the thoughts it sparked. Each year the crèche takes its place next to the entrance to the farm on Highway 49. It is a wooden cut out of Mary, Joseph, Baby Jesus, and others at the manger and is wonderfully painted. I realize I don’t know who the artist is who did this work. I realize, too, I don’t know how long this piece of art has been a part of the community. I do know it has been more than fifteen years because the crèche was here when I arrived. Who built the crèche? We should know that. People come and go at Koinonia. It has always been that way. We are a house of hospitality and would not want that to change. But what Koinonia needs most of all is a core of people living the communal life together for the long haul — serving God and God’s people at, through, and from this place called Koinonia Farm. We need members who pass on the stories and the history to other members coming to join them. A group of people who can tell us who built the crèche, who painted it, whose idea it was — the whole story. Yes, we do have a core of communal members. And we clearly understand how needed it is for that same core to still be here in another decade supporting and mentoring those who have come after us. Now we just need to find those who are coming after us. Living this way of life is counter-cultural in the West, but not completely foreign. It has been a part of Christianity both East and West from the beginning. Intentional Christian communities have played an important role throughout Christian history — they have founded hospitals, schools, worked for the poor, started progressive movements; they have prayed, lived quietly and humbly, sharing what they have, responding to the needs and challenges of the times, and have given or inspired the birth of so much that is good. Koinonia has been praying, living, and sharing for over 76 years now. And it continues to have much work to do. It is a big place with a large legacy and a deep calling to live up to the example of the earliest Christian church. Surely, there are a dozen people out there who are called to Koinonia. Do the following words from the Acts of the Apostles resonate? If they do, you may be called to Koinonia. They devoted themselves to the teaching of the apostles and to the communal life, to the breaking of the bread and to the prayers. Awe came upon everyone, and many wonders and signs were done through the apostles. All who believed were together and had all things in common; they would sell their property and possessions and divide them among all according to each one’s need. Every day they devoted themselves to meeting together in the temple area and to breaking bread in their homes. They ate their meals with exultation and sincerity of heart, praising God and enjoying favor with all the people. And every day the Lord added to their number those who were being saved. Here’s where the crèche comes in again: our dream is that one day very soon our membership will be large enough so that we can have a live nativity on the lawn on Christmas Eve for friends and neighbors to come and enjoy. Our prayer for 2019 is that God stirs hearts and draws people to join our community. And maybe by next Christmas, or the one after that, we can have a live nativity. P.S. If you know anything about the history of Koinonia’s crèche or you resonated with those words from Acts 2:42-47 and want to explore a calling to Koinonia Farm, please let us know! Email Bren at bren@koinoniafarm.org or call her at Koinonia Farm at 229-924-0391. She’d love to hear from you.